Pre-training on Virtual Reality prior to the Fundamentals of Laparoscopic Surgery (FLS): Is it beneficial? Introduction: We previously reported a proficiency-based Fundamentals of Laparoscopic Surgery (FLS) skils curriculum. 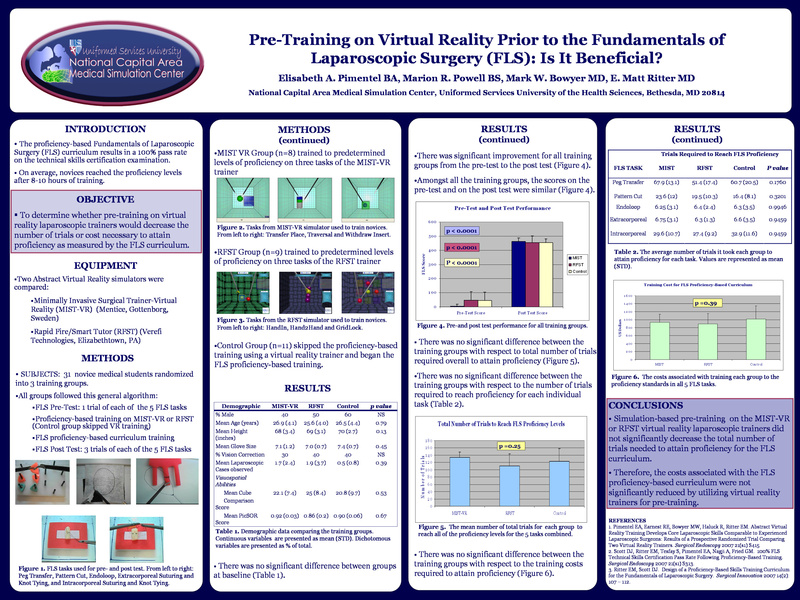 We hypothesized that pre-training on virtual reality trainers would decrease the number of trials needed to attain the proficiency levels in this FLS curriculum. Methods: All subject groups followed this general algorithm, FLS pre-testing, proficiency-based training using a virtual reality (VR) trainer, FLS proficiency-based training, and final FLS post-testing. Group I (MS1-2, n=8) underwent VR training on the MIST-VR (Minimally Invasive Surgical Trainer- Virtual Reality). Group II (MS1-2, n=9) trained with the RFST (Rapid Fire/ Smart Tutor) system. Group III (MS1-3, control, n=11) served as control and skipped the VR training step. Results: Group I and Group II achieved proficiency in all tasks during the virtual reality training. Group I and Group III achieved a 100% pass rate on the final FLS test with Group II receiving a 90% pass rate. No significant differences were detected between the three groups for total number of trials required to complete the curriculum, total scores on the final test, or training costs. Conclusions: Proficiency based pre-training on abstract virtual reality trainers did not significantly decrease the total number of trials or training costs required to complete the FLS curriculum. Abstract VR training does not appear to be beneficial for this type of application.